Today I had a great time doing Cliff Adventure. We climbed some rocks and I was a bit worried at first, but then I started to get the hang of it. Yenworthy is amazing and I have tried lots of new things. I really don’t want to leave! My room is awesome and it’s great to be sharing with my friends. We have been extremely fortunate with the weather and it has not rained. I have done lots of things with risky business. Now I can prove that I have climbed rocks, been surfing and orienteering! Day 3 and we wake up (still tired although we had enough energy to laugh) after a good day of Kayaking or surfing, depending on which group we were in. I was in Mr Dunstan’s group along with Jake (helper), Josie, Eleanor, Lilly, Abby, Charlie (Burnett), Boru, Jack, Conrad and David. After the long, long journey to Putsborough beach. We all got changed into our wetsuits, took the surfboards out of the trailer and made our way down to the sand by the purple cliffs (the cliffs were covered in heather). We had an introduction on surfing and then made our way to the water’s edge. I was the first out with the leash strapped to me right leg (otherwise I would be what’s called “riding goofy”) and travelled through the high waves to ride my first surf (of the day). Straight away a big wave came, and guess what, NOSE DIVE!!!!!!!!!!!! Second try: success! I also stood up at that point (only for a few seconds). The water gave me a brain freeze until I got used to it. 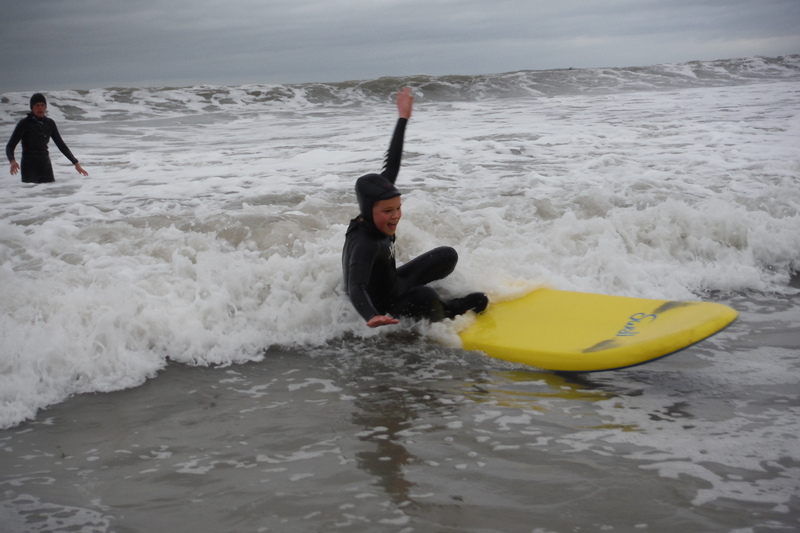 About half way through surfing, we were brought back into land and we were taught how to stand up. By then everyone found it easier to stand up. Everyone did amazing. Anyway, I also gave a headstand a try (inspired by Pete). First try and I managed to roley-pole over to the front of the board without nose-diving or falling off! David did a proper headstand (It was really cool). I eventually managed to do a headstand (YESSSSSSSSSSSSS!!!!!). After surfing we had Paul’s (the one and only amazing cook) delicious flapjacks that were gooey and sticky, everyone liked (loved) them. The weather was just too good. None of us want to go home because we could all easily live here, at is all amazing, everyone is kind and we all feel at home here (although I secretly think that some of us are missing home a little). Looking forward to Cliff Adventure tomorrow! Today was amazing … we went kayaking and my group made me do all the paddling!!!!!! I have been missing my parents but, my group has been helping me get through it, so far it has been AMAZING and I am really enjoying it. The other group went surfing … surfing was really good; I stood up over ten times (but it was really hard.) I never want to leave!! 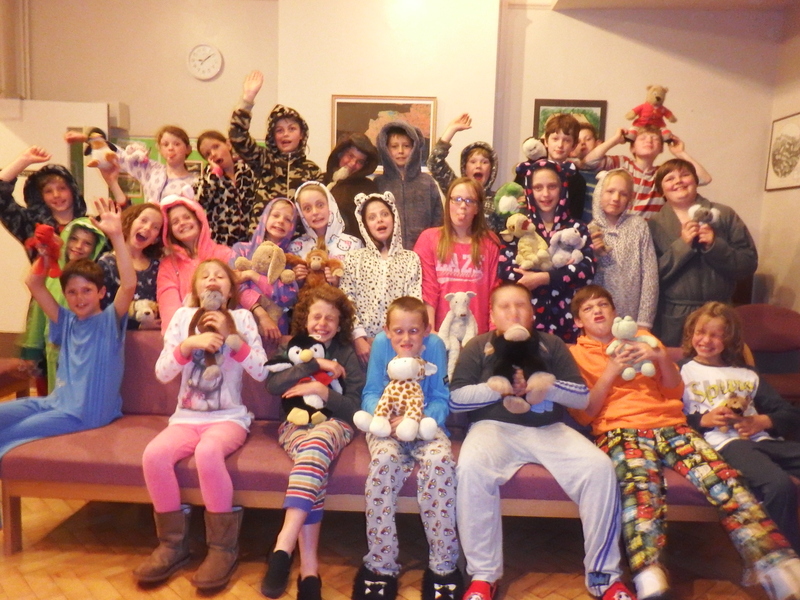 Everyone is having sooooooo much fun and tonight we are going orienteering in the dark I am so excited for kayaking tomorrow and I don’t think any one’s going to get much sleep. The food and the lodge is amazing with amazing staff too. 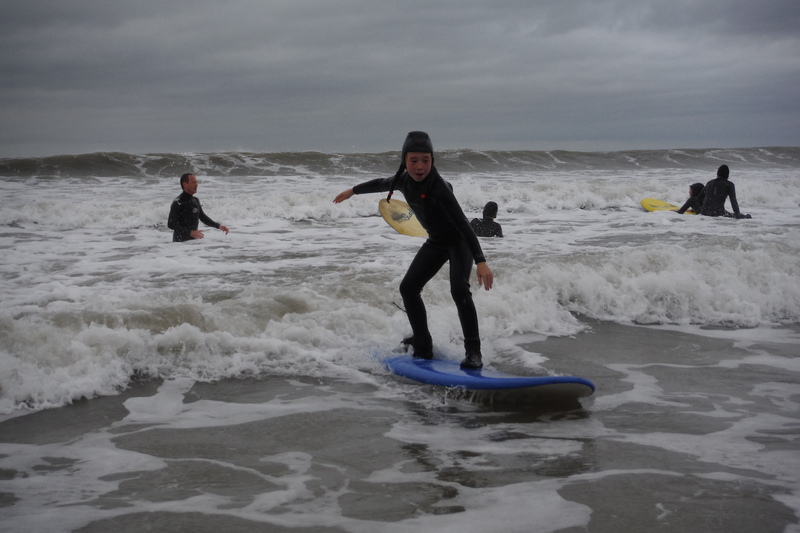 The surfing experience was amazing, it was such a blast! I now want to go surfing every week! Plus the food is so amazingly well cooked, tonight is spaghetti bolognese. Yum! There is a cool ropes course and the day you arrive you put you into teams and you go round the course. Hello, it’s me…Evie. It has been fab today- we’ve been surfing. The amazingness started with a great breakfast of shreddies and baked beans on toast. After, we got ready and packed our bags. An hour later we got off the minibus and got changed into our wetsuits (I struggled because it was really tight). Then we got down to the beach and learnt how to get on our board (we were the best listeners they’ve ever had!). Nayah and I worked together – it was cold and wet (obviously). I managed to stand up once; however, I was only up for two seconds before falling straight back into the water behind me, which happened to be FREEZING cold. I hope Molly is having a great time in Glazebury. I miss you so much and I can’t wait to see you tomorrow- even though I never want Yenworthy to be over because it has been brilliant. Night Night. The surfing was so fun; the waves towered over you when you tried to lift the board up (you were rewarded by the board smacking you in the face). But when you stood up it was really worth the effort. When you were pushing the surfboard out to the waves you saw all the really good surfers doing flips and turns all along the waves – there’s a long way to go until I’m anything like that! Rock pooling was really fun and so was the climbing. The climbing looks a lot harder than it actually is –especially ropes – they looked so confusing at first. 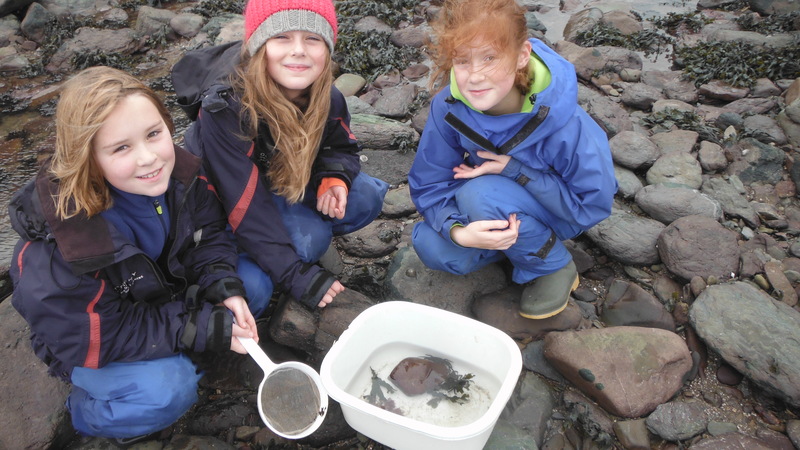 When we were rock pooling we got loads of crabs, fish, shellfish and sea anemones. Apparently the beach had the second highest tide in the world! Love Tiye. In the morning we had the room inspection … we got a 10! For breakfast we had scrambled eggs on toast. I had a milky brew ( a very milky tea ) with my breakfast. Yesterday we went surfing. The wet suits were VERY tight! It turned out that I was wearing my wet suite on inside out the whole time … oops. The water was soooooo cold and the waves completely towered over me (like most things). 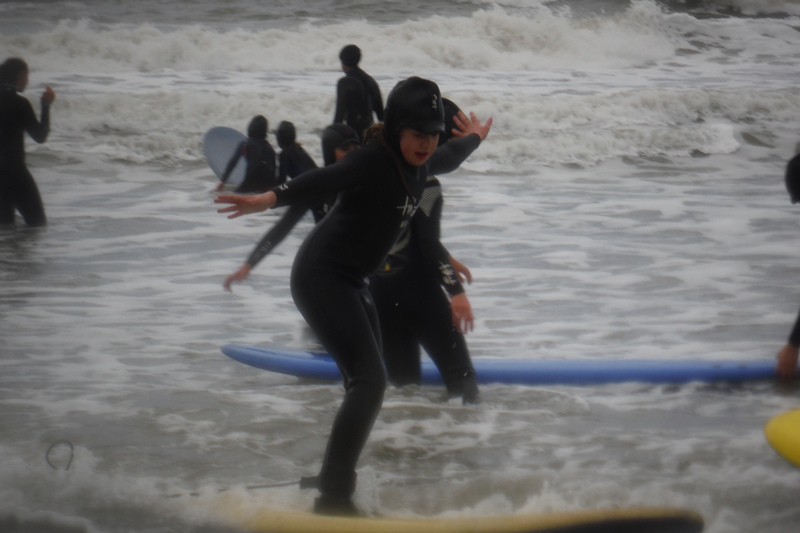 I was soooo surprised when I actually stood up on the surfboard (and yes I was on water and yes I was moving). The feeling that you got when you stood up on the surf board was amazing, but the feeling does end quite abruptly when you throw yourself off because you think that you will crash into Taomi and Dylan. Hi! This is my Yenworthy blog. Today my group and I went canoeing (although I have no idea where we went). The minute I saw the canoes, I knew it was going to be awesome! We started off just rowing calmly, nice and peaceful, and then we got the sailing equipment out, and man, we flew! We smashed all the other teams in a race and then the water fight came (although Alessandro didn’t get the idea of splash the other teams, not your own J) We got very wet, but it was a cool experience. I loved that activity, mostly because we didn’t have to put on a wetsuit on like yesterday. To mum and Nathan (and anyone else at home). Also if you don’t know what surfing is then stop reading this! huh! the wet suits were a mission and a half to get on and off!! Hi today we went canoeing it was super fun. So in the morning we did our duties as normal I was a server and what that means is I have to serve out all the food. 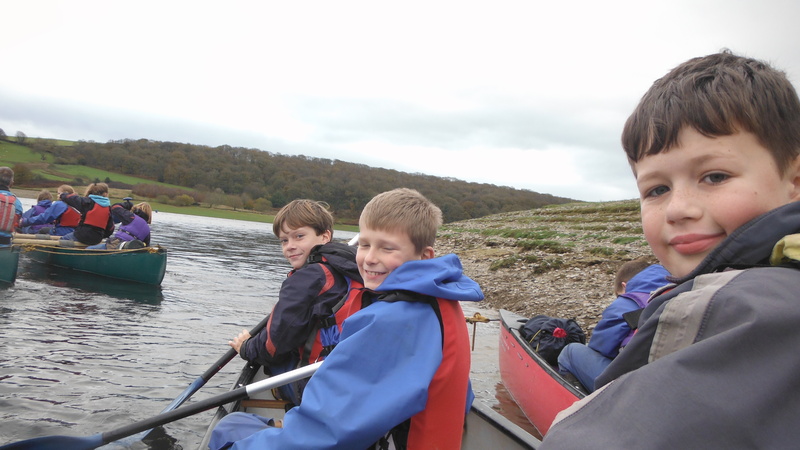 After that we got told we were canoeing I was a bit nervous but excited. So then we went on the bus to a huge lake, and tide two canoes together. We put them on the water and rowed them away. Sailing is another thing we did I held up the sail and so did Louis. We went super-fast and got to the other side of lake in 10 minutes. After that we used Kelly kettles to heat water and had hot Ribena and roasted marshmallows it was nice and finally had a water fight we got very wet. So now we are going to have our tea have some free time and go to bed. So night mum, dad Millie and Kailey I’ll see you tomorrow love you. P.S: tell Skye, Max and Tess I miss them and I hope there behaving. Hello, from the Yenworthy. It’s been really amazing today! It started with a really fabulous breakfast of cereal and toast with scrambled egg. The activity that we did today was either surfing or canoeing. I was in the canoeing group so tomorrow I will surf. It’s going to be great. When we got there we firstly went across a part of the lake (Wimbleball Lake) and we got off and had some lunch. 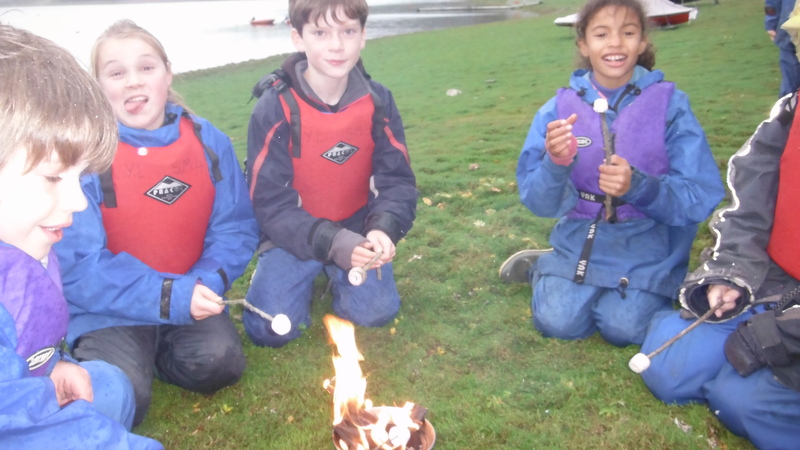 Later we made a fire and toasted marshmallows on it after that we had a huge water fight with the FREEZING cold water. It has been so good so far and I can’t wait to see Mum, Dad, Molly Bear and Flo again. Bye. Today we had an amazing day at Lynmouth beach. 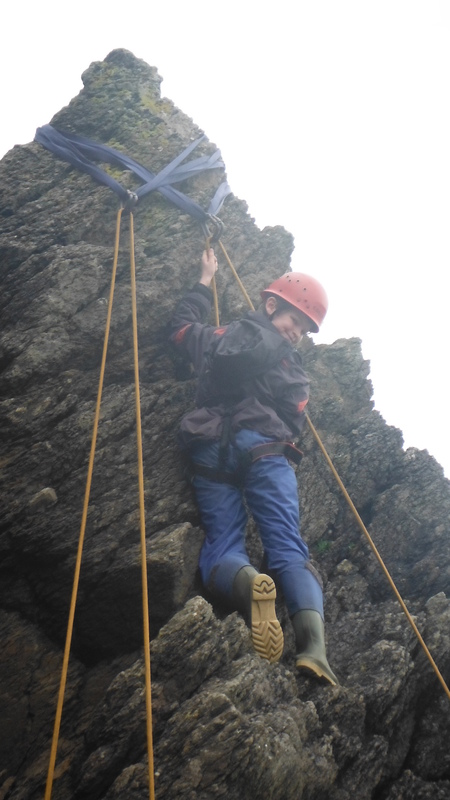 Firstly, everyone got into their groups and did different activities, like: rock climbing, coasteering and rock pooling. My group did the rock pooling first and each person found something, maybe more. Nayah and Mrs Morris found a scorpion fish which would sting you if you touched it. Coasteering is when you explore a place and you squeeze through small spaces. (Mr Dunstan got soaked which was really funny). Rock climbing is where you climb big rocks and try to get to the top (it makes you feel happy when you get to the top). Rock pooling is when you look for interesting creatures and study them (some creatures are awesome. Today was a brilliant day to start the morning off we went down to the dining room and had a sensationally delicious breakfast; you could have cereal and a bacon butty or just one of them. After that Nick asked us what filling we would like in our sandwiches there were: jam, ham, egg and mayo, chocolate spread and plain spread. Then it was happy hour when we were put in groups to do duties around yenworthy. Today group c were tidying the workroom and the lounge. Next we went and got into some old cloths, packed are bags and collected are lunch. 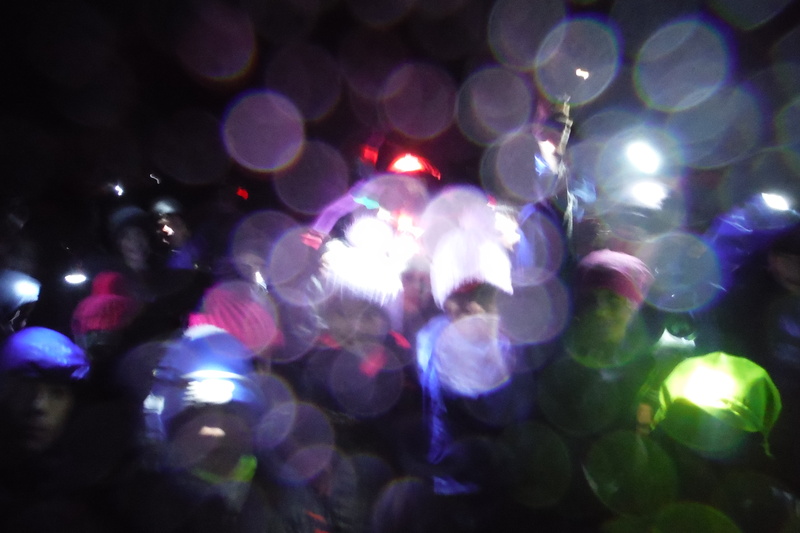 Then we went out in our water proofs, and packed helmets and harnesses. Then we set off in 3 mini buses to Lymouth beach. 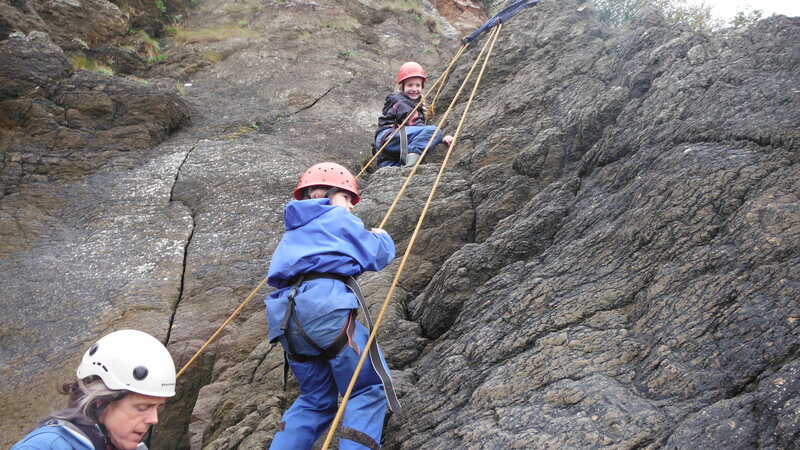 When we were there we did rock pooling, coastering and we did rock climbing. First my group did rock pooling and found lots of crabs and limpets. Then we went coastering squeezed through lots of small gaps and jumped over lots of rocks. After that we went rock climbing it took 2 or 3 people to get 1 person up. Today was an amazing day it was really fun. 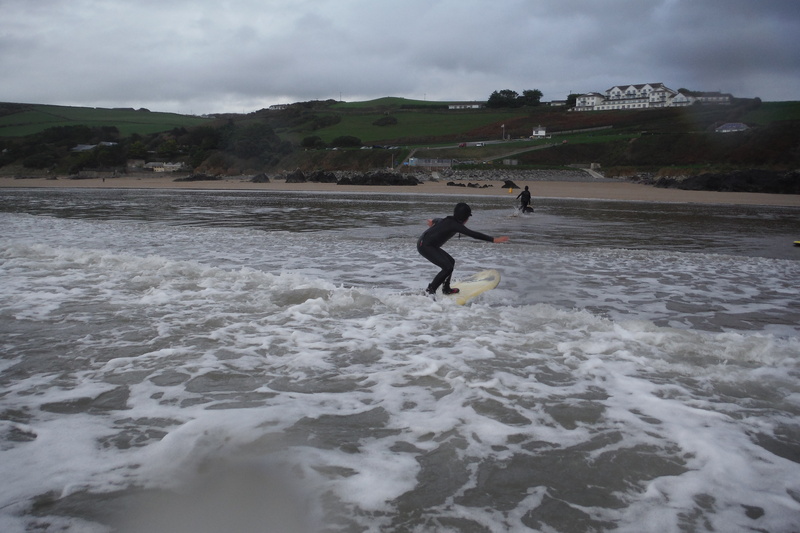 Today some of the class went to do surfing at Putsborough beach and the rest of the class went to do some canoeing. For the surfers the girls had to wear a swimming costume, a rash vest, a wetsuit, a swimming cap and a pair of shoes. The boys had to wear some swimming trunks, a rash vest, a wetsuit, a swimming cap and a pair of shoes. I caught lots of really good waves and I stood up quite a lot of times. I had lots of fun doing the surfing and so did everyone else. Putsborough beach was about an hour away. Can’t wait to see you all back home! Today we had a delicious breakfast it was serial and scrambled egg on toast, and for tea we had beef stew with some rice pudding and jam for pudding (which were both AMAZING). We went canoeing in a massive lake; we had a water fight with (FREEZING!) water. We can’t wait till we see you: Mum, Dad, Sonny, Teddy and Boo. Surfing tomorrow we can’t wait! Hi I am Alessandro and I say hi to all the people who are reading this blog (especially mum and dad). I have had so much fun during these three days it has been awesome the food here is quite good after all we need to eat as much as we can because of the activities. When we arrived we were sorted out in our rooms. I am in a room with Rudy, Charlie and Rory. On the first day we did climbing, rock pooling, and coastering. Today we spent all day surfing and I managed to ride a wave and stand on my board for over five seconds. Right now I am getting ready for diner, I have had an amazing time and I hope that the rest of the days will be as fun as these. Hello we are at Yenworthy having a great time. 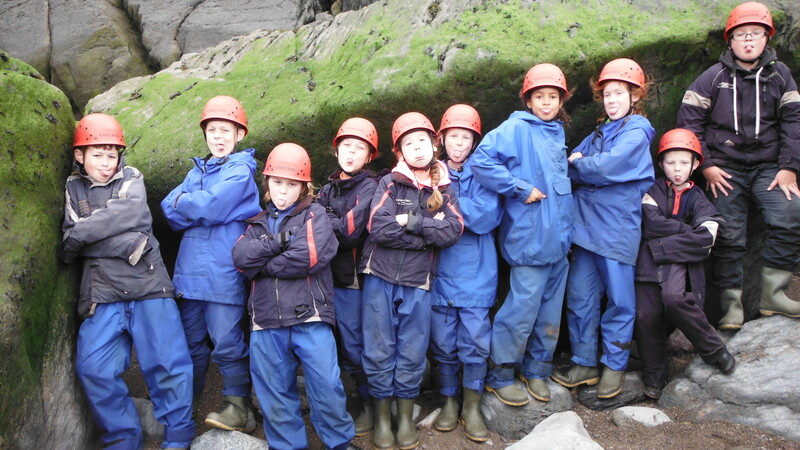 Today we went down to the Lynmouth beach and had very fun activates. First, we went looking in the rock pools and we found 3 crabs, a shrimps, 2 slug worms and a sea anemone. I found a sea anemone that look like a strawberry because it was red and had green spots. We had a lady-called Nick- with us that new all about rock pools to help us. The crabs (we had) ate the slug worms. I was with Chloe and Lucy. Next, we went to do rock climbing with a lady called Nick we went on 3 like one was very hard, one that was quite hard and one we had to go was like a chimney. That was very fun. Here at Yenworthy in Devon we are all very excited to tell you about what we have done. So first off we went rock polling. We found rocks and creatures like crabs and sea weed (it was very fun).We also found slug worms, fish, and sea anemones. It was all very fun and exciting. Next after lunch we did rock climbing, it’s super complex. One of us had to reel the rope, the other climbing and the last one is supporting the one supporting the rope. The climbs are called Sling Corner, The Crack and Pinnacle. I only did two of the climbs they were exciting but nerve racking. The last thing we did was coastering we got very wet. What Coastering is climbing on rocks without a harness its super fun. The sea was splashing us a lot. The rocks were very slippy I fell over but I was fine. Last off all we made figure out of natural objects we found on the sea. Me and Rudy made a surfer as there was a competition there for professionals. They all locked very good we also found some good stones and made something on how we felt today. Here we are at Yenworthy in Devon. I am very excited to explain to you what we have done today. For the future year sixes, it’s great fun. The first activity we did was searching for creatures or interesting plants in rock pools it was very fun. We found lots of things like loads of crabs, sea anemones, which were red blobs or things with sticky tentacles that waved in the air, seaweed, shrimps and a long green slug worm. 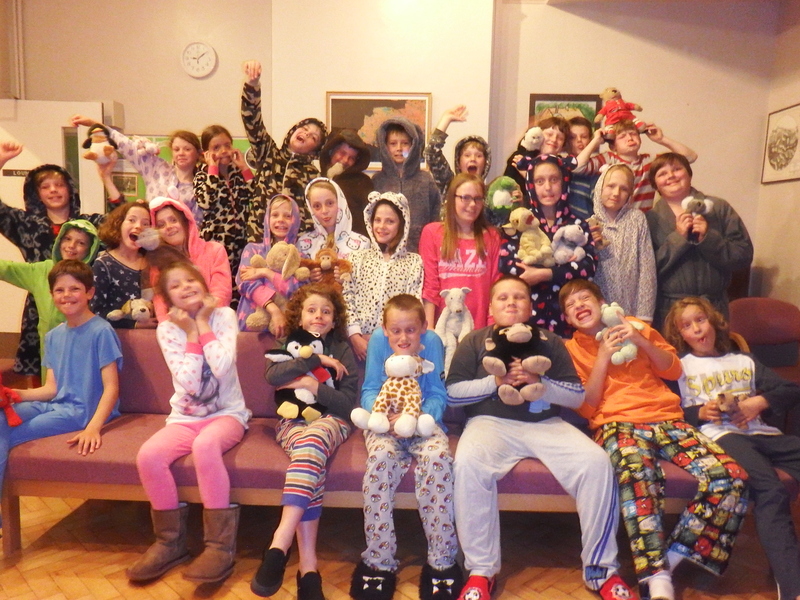 Yenworthy 2014 – last post! Hi its ‘’BT’’ YENWOTHY is great! When we got here we had a talk through all the rules and everything we’re doing. After we were told what rooms were going to be in, I was put with Rowan, Johnny, Jamie, Archie. Then we got into some more sortable cloths, and went over to the rope course, Nick (are main instructor) tort us how to do the rope course. once that Was over we had some tee and about half an hour after we went on a walk around the moor. Then was bed time. The next morning we had breakfast then we went surfing. At surfing, on a sandy beach we paired up and shown how to surf. We learned how to stand-up. After that we went back to Yenworthy. When we got back we had showers and then we had supper and went orienteering. The next day we went kayaking and coasteering. Kayaking was great fun because we stopped off by a cliff and jumped into the sea and then sailed back. After we went coasteering along the rocks with Nic. The next day we did Cliff adventure with Sketch and Nic. And we went rock pooling, rock climbing and made rock sculptures. Now we are going to play hide and seek. That’s it for now. Goodbye, from Ben T.